Front page Design for Penny Auction website. Need design of front page only according to instructions written below. I will hire the winner to design all the rest of the pages. ◦ Main banner with info (right under header). ▪ Prize description, username of the winner, date of winning, amount of bids used by winner to win the prize. • Few text pages: Terms, Privacy etc. • Each auction will be either running live, have a timer when it will be launched or be marked ”starting soon”. This will be set from admin panel. ◦ For auctions that are ”starting soon” users will not be able to bid. ◦ For auctions that have timer, but have not started yet, users will be able to set auto-bidder only, which will start working once the auction has started. ◦ For auctions that are active, user will be able to bid normally and set auto-bidder. • There will be no physical goods in auction. • 2 types of auctions. • Each auction will have an image. But they will all be similar with text cash/bid and amount. • Won prizes will be automatically credited to clients account when he wins them (he will not have to pay for them). 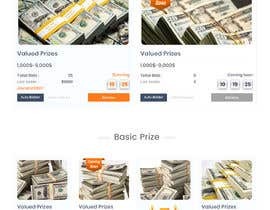 • The will be no counter of how much the prize costs (since they will be free), but there will be a counter how many bids have been made on each prize. ◦ “Bid” button to make a single bid. ▪ Empty field to enter amount of bids. ▪ Once auto-bidder is launched previous field and button will be replaced with counter of remaining bids and “stop auto-bidder” button. can you provide your logo or tell me more about what color scheme do you want for your website ? If you want to participate submit your work. That's it. No other way around it.